A non-surgical, non-invasive cosmetic procedure, our photofacial technology uses gentle pulses of light to safely and effectively eliminate years of sun damage, redness and brown pigmentation, literally “turning back the clock.” This treatment works to rejuvenate the skin by enhancing dull or gray complexions as well as smoothing out uneven pigmentation, reducing the appearance of large pores and even improving symptoms of Rosacea—a skin disorder characterized by severe redness. 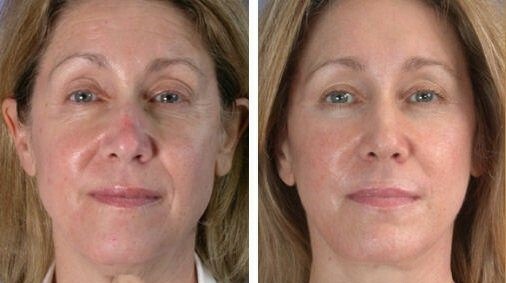 Photorejuvenation uses a series of uniquely shaped light pulses that gently penetrate the top layers of the skin to break up any lesions or vessels, allowing the body to undergo its natural healing process. Because the treatment was developed to specifically heat the intended target spot, the surrounding areas won’t experience any damage or discomfort. Skin will appear even-toned, healthy, and youthful. Each session lasts anywhere from 15 to 30 minutes. First the treated area is cleansed and a cooling gel is applied to the skin. The light pulses are then delivered, improving the look and texture of the treated area. Once the process is complete, the cooling gel is removed. The procedure requires no anesthesia. The initial treatment may not be as aggressive as your following treatments so as not to possibly damage the skin and to determine your skin’s tolerance for further photo facial treatments. Photo facial treatments are usually performed every 3-4 weeks. Most patients require 4-5 treatment sessions for maximum results. Follow-up sessions may also be recommended by Sculpted Medspa for maintenance. Considering an IPL? Please contact Sculpted Medspa today to learn more about this skin rejuvenation procedure or to set up a consultation.